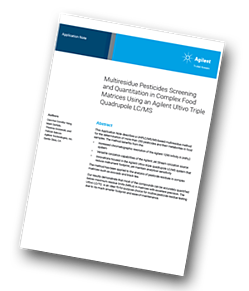 Agilent Technologies has produced an application note describing a UHPLC/MS/MS-based multiresidue method for the determination of more than 250 pesticides and their metabolites in food samples using the Agilent Ultivo Triple Quadrupole LC/MS. The screening and quantitation of pesticide residues in food is one of the most important and most demanding applications in food safety. Regulatory agencies have set maximum residue limits (MRLs) for hundreds of pesticides and their metabolites in food. Most MRLs are set at low part-per‑billion (ng/g) levels, posing significant challenges to screen and quantify hundreds of analytes in complex matrices simultaneously. Therefore, reliable analytical instruments and methods are required to quantify pesticide residues with confidence. Typically, multiresidue methods based on LC/MS/MS or GC/MS/MS are used. The criteria for the identification of pesticide residues and requirements for method validation and quality control procedures for quantitation are specified in guidance documents such as SANTE/11813/20172. The Agilent Ultivo triple quadrupole LC/MS is designed to address many challenges faced by routine production labs, especially in the environmental and food safety arenas and in this application was coupled to an Agilent 1290 Infinity II UHPLC system. The method has been applied to the analysis of pesticide residues in complex matrices such as avocado and black tea. Innovations housed in the Agilent Ultivo triple quadrupole LC/MS system that reduce instrument footprint, yet maintain analytical sensitivity. Results demonstrate that most of the compounds can be accurately quantified below maximum residue limits (MRLs) in matrices with excellent precision. The Ultivo LC/TQ is an ideal fit-for-purpose choice for routine pesticide residue testing due to its much smaller footprint and ease-of-maintenance. Technological innovations within the UltivoTriple Quadrupole LC/MS system provide the robust detection and easy maintenance that suits routine production labs with enhanced capabilities for non-expert LC/MS users. The total workflow solutions offered by Agilent that include sample preparation, databases, and reporting are shown to facilitate fast method development and validation in food safety analyses.